VietNamNet Bridge - People in the area of the strange skin disease are anxious with their fate while the Ministry of Health is struggling to "decode" the disease. The disease that has killed 23 people in Quang Ngai is raging violently. In 2012, Mrs. Ngap was infected with the disease. She was well again after two months of treatment. But the disease has recurred. 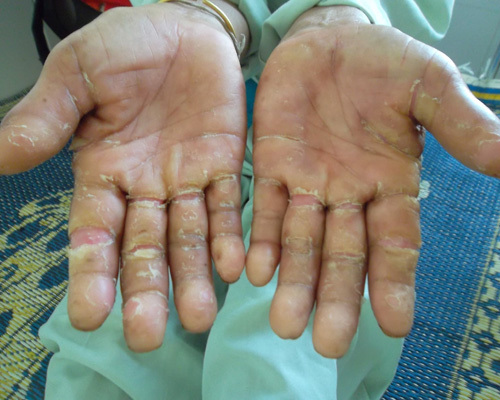 The "strange" disease, which is called by the Ministry of Health as dermatitis syndrome on hands and feet, in the central province of Quang Ngai has recently returned with new cases, while the specific cause of the disease is still vague. Since late February 2013, the bizarre skin disease has come back in the mountainous districts of Quang Ngai. On March 6, the total number of patients was 12. Of the 12 patients, there are 2 cases of recurrence. The latest case is Mrs. Pham Thi Soi, 60 years old, in Reu village, Ba Dien commune. This is also a case of recurrence. Last year, Soi had the disease and was well again after treatment. Two members of her family were dead by this disease, including her daughter, Pham Thi An, 26, who died in July 2012 and An’s son Pham Van Sam, 4. The disease has killed 23 people, but so far health experts have not found the cause. The 2nd case of recurrence is Mrs. Pham Thi Ngap, 75, also a resident of Ba Dien commune. Notably, the "strange" disease not only broke out in Ba To district, but also appears in the mountainous district of Son Ha. The two patients here are Mr. Dinh Van Hoan, 63 years old and his wife Dinh Thi Lo, 57, in Ka Park Village, Son Ba commune. The two patients were treated at the Dermatology Ward of the Quang Ngai Province Hospital on February 19. The couple has escaped the hospital to go home. Mr. Le Han Phong, Chairman of Ba To district, says that the "strange" disease is developing complicatedly. He wishes health experts will soon clarify the cause to definitively treat people. The people of the mountainous districts of Quang Ngai province are worried for their life. While the Ministry of Health announced to "find the causes and successfully control the bizarre skin disease which appeared in Vietnam for the first time in Ba To district, Quang Ngai” and called this as one of the 10 achievements of the health sector in 2012, the disease has flared up again. Chief of the Department of Preventive Medicine--Nguyen Van Binh says: "The test of rice used by farmers in the area of the strange disease (Ba Dien Commune, Ba To district) in a Hong Kong laboratory finds out some kind of poisonous fungus but it does not indicate the exact type of fungus which is the specific agent of the disease." Many experts have come to survey and collect samples for testing but in the last two years they have yet to determine the cause. 2012 was the peak of the "strange" disease. The Minister of Health--Nguyen Thi Kim Tien visited Quang Ngai to inspect the disease. After that health experts said that "eating moldy rice is one of the suspicious factors." However, the Ministry of Health has not confirmed that eating moldy rice as the cause of the disease. Mr. Pham Van But, Chairman of Ba Dien Commune, says that he and the local people are very worried of this disease. He adds that the district authorities firstly provided the local people 15 kg of rice per person per month. In August 2012, it reduced to 4 kg and nothing. Since then the local people have eaten moldy rice again.